Food labels can be confusing and I've tried to sort through some of the muddle in past posts like this one on Debunking Food Labels. I recently asked our friends at LWS for guidance and Lydia Lui agreed to lend us some advice on what we should hone in on as we shop to support our new Mediterranean Lifestyles. Lydia Lui is a senior at the University of Maryland working with LifeWork Strategies as a Community Health intern. She has a particular interest in nutrition and really enjoys food, hiking and playing all kinds of sports. She is very excited to be a part of this 30 day challenge and is looking forward to hearing about other people’s experiences with this new diet. When walking down the grocery aisles, it’s easy to grab a snack without reading over the food label. How often do we remember to check to see what’s really inside your food? We might look at the calorie amount, but forget to consider the quality of the food we’re eating. Check the serving size first when reading food labels. The nutritional information for the food product is based on one serving, so if you were to eat two servings of the food, you would double the nutrient and calorie values. If you eat the whole package, multiply the values by the total number of servings in the package. Next, take a look at the total calories per serving and the amount that comes from fat. Try to limit foods high in fat calories. Saturated and trans fats raise your “bad” cholesterol, also known as LDL, which puts you at risk of heart disease and stroke. Fiber 25-30g: Whole wheat bread should contain at least 2g of fiber per serving. Cereal should have at least 5g. Also make sure to check the list of ingredients in your food. Ingredients are listed in descending order by weight. Look for whole grains as the 1st ingredient rather than refined, bleached flours, and make sure there are no added sugars or artificial sweeteners. Also try to eat foods that don’t have sugar as one of the first 5 ingredients, which may be listed as sucrose, fructose, dextrose, or high-fructose corn syrup. 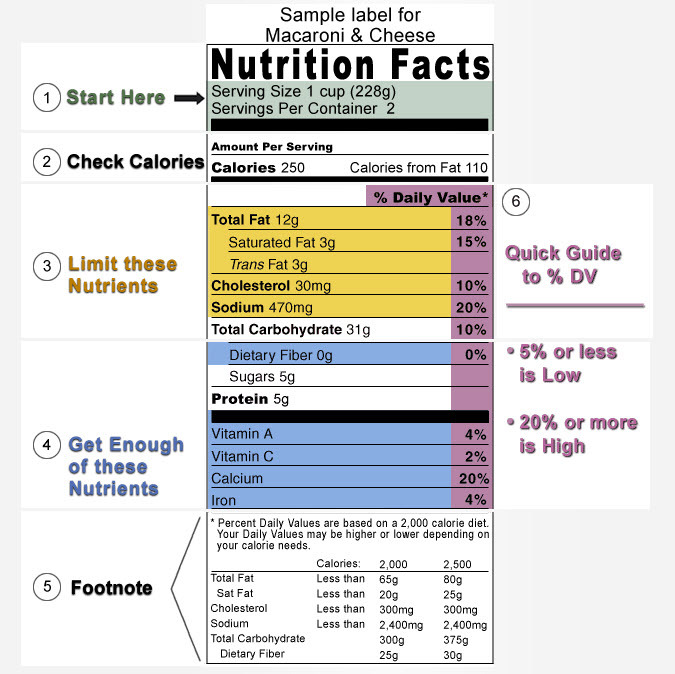 This link from the FDA gives a very informative overview on how to read food labels and what to look for when comparing foods to eat. The American Heart Association also provides a great resource for definitions of nutrient content claims. For example, what’s the difference between fat free, low fat, and reduced fat? Labels can also claim to be "reduced or less" sugar or sodium - which only means it's only reduced by at least 25%. At least 25% less sugars per reference amount than an appropriate reference food.